On the October 30 broadcast of JTBC’s “Please Take Care Of My Refrigerator,” Jimin talked about why he almost didn’t make it into BTS. Despite being a talented dance major who placed first in his entrance exam for Busan Arts High School, he surprised everyone by divulging that it was his dancing skills that nearly cost him his chance to debut. 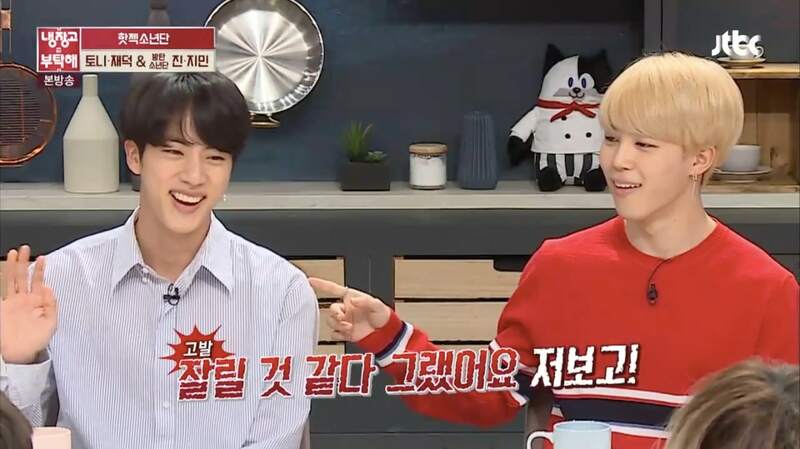 Jimin also said that when he first arrived at BigHit Entertainment as a trainee, Jin didn’t think he would last long at the agency, leading Jin to joke that he was worried that Jimin’s many fans would be upset with him. Jin went on to share that now, it is Jimin who helps him and Rap Monster learn their choreography and perfect their dance moves. Jin and Jimin also revealed the contents of BTS’s fridge on this week’s episode!